“Luck be with ye” … so says this devilish imp who could warm your heart and bring a smile to your face any time you set eyes upon him. Of all the good luck symbols in the world, the Leprechaun is best known for his ability to bring good luck and good fortune into any home. Beautifully crafted and hand-painted, this charismatic figure is about 2″ tall and seems to have a life of his own. Wherever he sits in your home, all eyes will be drawn to him. 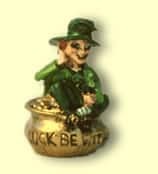 So, place your Lucky Leprechaun on a mantel over the fireplace, or in any favorite spot in your home… but don’t hide him. This little rascal needs attention. If you need a lift, now is the time to adopt your very own Lucky Leprechaun. Then all you have to do is sit back and wait for good things to happen. This irresistible imp could make life worth living again. I requested the Lucky Leprechaun about two years ago. As soon as he was in my house, the luck began. For about two years, I was trying so hard to moved out of the area I was living in, and in about two months, after receiving the Lucky Leprechaun, I found a calmer, nicer place to live with my son. I got promoted at work and I found that I was starting to have some money left in the bank. I use to feel like I had no luck in my life, but after the lucky leprechaun came to live with me, I started feeling what luck was about. A year later, I am now the owner of a house, and have the job of my dreams in a law firm. I feel like I owe it all to my Lucky Charm. The Lucky Leprechaun has brought me some luck already! I have won $250 in the lottery. Thank you.